Unlocked Lock the Keyholes at Halloween Town and Neverland. 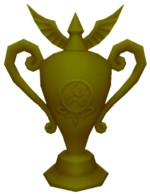 The Hercules Cup is the third tournament at Olympus Coliseum in Kingdom Hearts. Afterward, Phil puts up the trophy in the Lobby. If Sora has already completed the Phil Cup and Pegasus Cup, Sora will also obtain the Trinity Push. Completing the Hercules Cup also allows Sora to pick up the Olympia as well as seal the Olympus Coliseum Keyhole. Cloud now has an "Omnislash" ability, which causes him to fly around and hone in on you and your party members during each attack, and makes him invulnerable to damage. Apart from that on top of more strength and HP, his other attacks are more or less the same as in the preliminaries. Cast an Aero spell to halve the damage, dodge where necessary, especially during his Omnislash; attack him where there is an opening such as blocking his normal sword combo, and heal where necessary. Beating him will grant the player the Metal Chocobo Keyblade. In all modes, Sora fights this round without any of his party members. Hercules starts the match surrounded by a golden aura, which grants him invulnerability to damage. Throwing the barrels that appear on the field at Hercules will dispel the aura, occasionally stunning Hercules, as well. At this point, Hercules will be vulnerable to your attacks for a short period before he become invulnerable again. All the while, avoid his attacks: He initially uses a charging punch, which must be dodged, and a shockwave attack, which can be avoided by jumping. As Hercules accumulates damage, he will begin using a spinning sword attack and rushing you like a bull. The spinning attack can be blocked, and it may cause Hercules to be dizzy for a few seconds, providing an opportunity to attack freely, if his aura is gone. The rushing attack can be blocked or deflected for Tech Points. Late in the battle, Hercules will use an explosion of energy similar to Stun Impact. The best opportunity to throw a barrel is when Hercules stops to pose. There is a glitch in time trial mode in which if you reach Hercules with time still on the clock, you can select restart in the pause menu and fight Hercules with the clock frozen at whatever time you had left. Despite Sora fighting Hercules alone, Sora tells Phil that his friends make him unstoppable at the end of the Cup. This page was last edited on 7 April 2019, at 20:44.